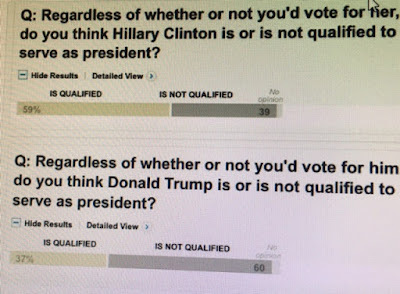 The latest batch of polls have just come out and they all show the same thing-a close but steady advantage of about 3-7 points for Hillary Clinton over Donald Trump. 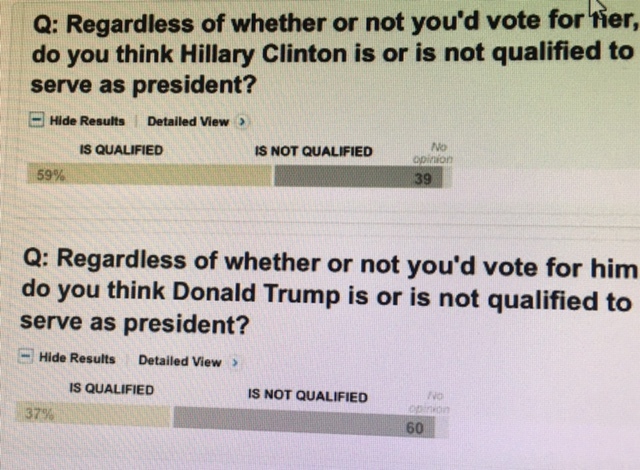 In the ABC News/Washington Post poll [taken between July 11-14] Clinton is up by 4 points over Trump. In most of the swing battleground states, as seen in the Real Clear Politics website, Clinton again has a small but steady lead. What is hard to believe is that Clinton maintains a small lead despite having maybe the two worst weeks a presidential presumptive nominee has ever had, basically [in Hugh Hewitt's words] "being convicted but not indicted" by FBI director James Comey. But I don't believe the fact that she has a small lead in the head to head match-up or in the battleground states with Trump is the most worrisome news for Trump, as these polls will surely go up and down. If those numbers continue, in even close to that range, we might as well sadly start practicing to say, Madame President, on January 20, 2017.